Could Lou Gehrig Sign A Baseball After ALS Paralyzed His Hands In 1940? Does Heritage’s Gehrig Ball Show The “Pride Of A Yankee” Or The “Skill Of A Forger”? 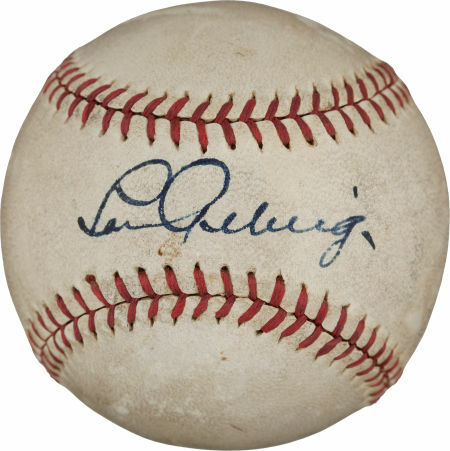 Could Lou Gehrig have signed this c1940 baseball being offered by Heritage Auction Galleries? By 1940, Gehrig had already come to grips with losing his picture-perfect swing, but as an ailing sports legend he found he couldn’t even sign an autograph for an adoring little kid or write a letter to a close friend. Gehrig had to use a stamp to sign his letters for his job at the New York Parole Board and his wife Eleanor would either ghost-sign his signature or use the same rubber stamp to honor autograph requests from his fans. Based upon the Gehrig correspondence and other information he had gathered, Eig determined that by 1940 Gehrig could no longer sign his own name. 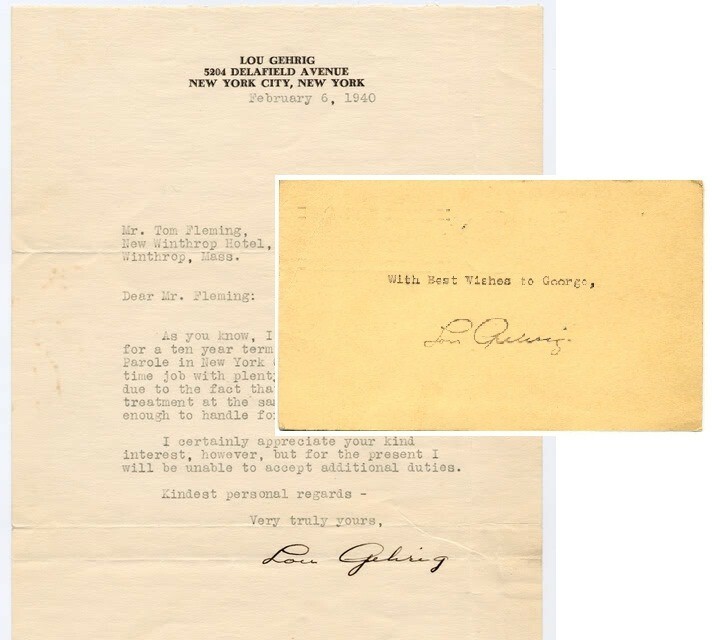 Says Eig, “I’m fairly certain that Eleanor was signing everything for him by that time.” In support of this determination, it appears that the last letter Gehrig signed “Lou” in the O’Leary correspondence collection bears a date of December 10,1939. All of the handwritten notations on letters from Gehrig to O’Leary from that date until Gehrig’s death appear to have been signed and executed by Eleanor Gehrig. This letter from Feb. 6,1940 is ghost-signed by Gehrig's wife and the post card (inset) bears a stamped signature created initially for Gehrig's use at his Parole Board job. The stamped signature is post-marked, July 12, 1940. Although he suffered paralysis in his hands, Gehrig could still write, almost illegibly, as evidenced on legal documents he actually signed in 1940 and 1941. His post-1940 signature was extremely shaky and almost illegible as compared to his signature before his illness took hold. The best examples are signatures executed by Gehrig on settlement agreements dated December 19, 1940 with the New York Daily News, and March 26, 1941 with the New York Life Insurance Company. At the time Ivy gave that statement he was still inclined to include the ball as part of his February 23rd live auction event in New York City alleging it included a genuine Gehrig signature on the sweet-spot of the Official American League ball made by the Reach Company in 1940. But we still asked, how could this be? 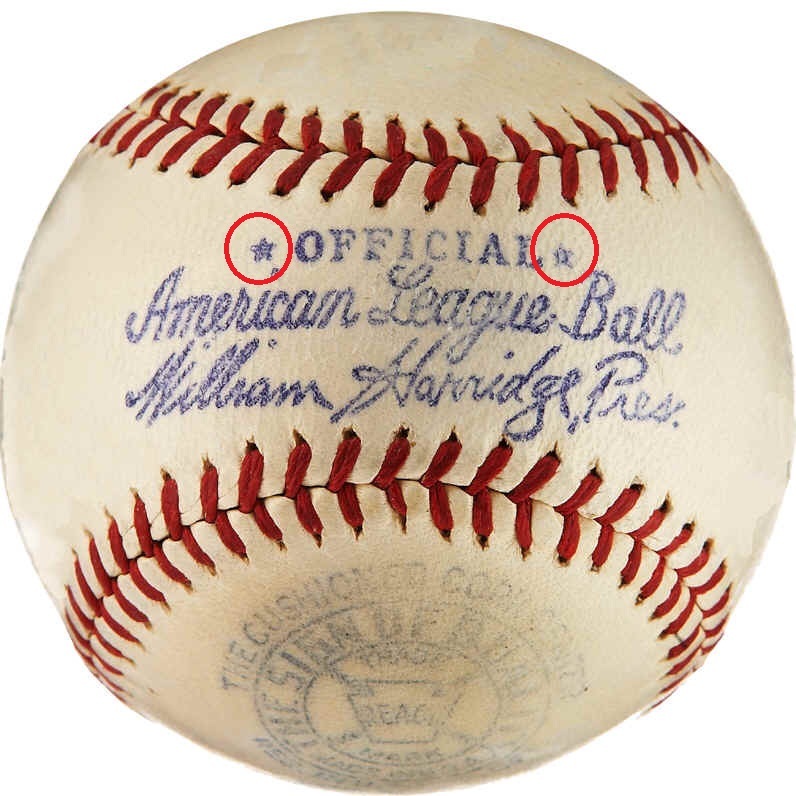 This style Official American League Reach baseball was manufactured and used in play between 1940 and 1942 as evidenced by the two stars (circled in red) located to the left and right on the word "OFFICIAL." 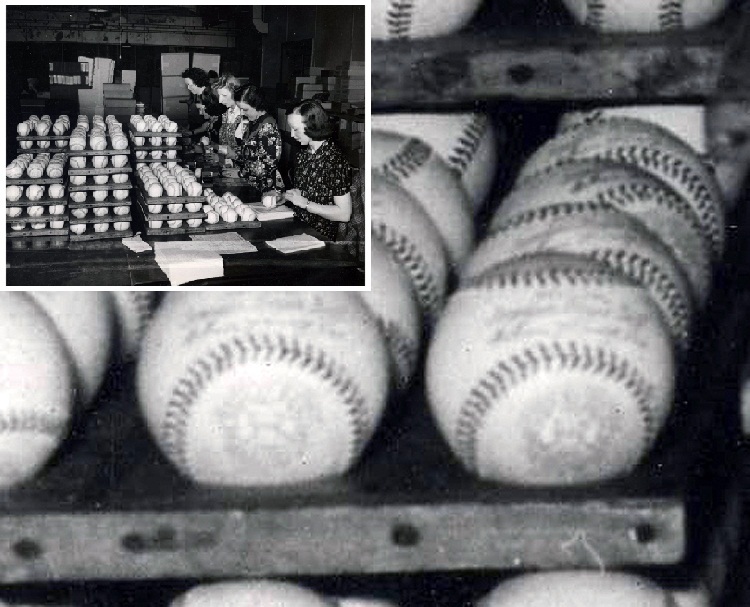 The American League balls were produced in the off-season and introduced to Major League play for the first time each season during Spring Training. Grunbaum has definitively dated the model of the Heritage Gehrig offering as being manufactured between 1940 and 1942. This photo was taken at the Spalding factory in Chicopee, MA, showing the Reach baseball manufacturing line on April 4, 1939. 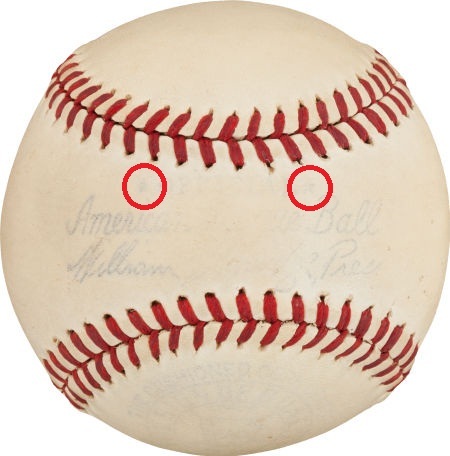 An enlargement of the baseballs being made reveals that the balls have no stars on the sweet spot. It is further proof suggesting that the 2-star variety was only made in 1940 and would have been impossible for Gehrig to have signed (Photos Courtesy of HistoryoftheBaseball.com). 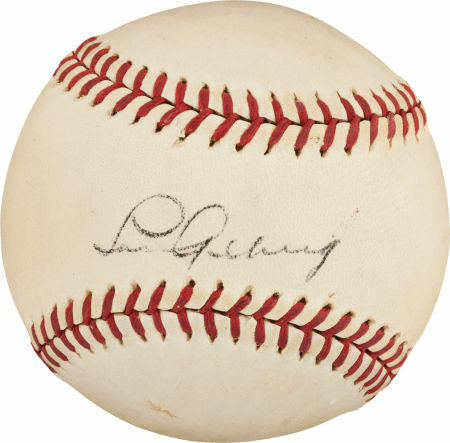 The alleged Gehrig-signed baseball offered by Heritage appears to be a 1940-1942 Official American League Harridge baseball manufactured by Reach. The Heritage ball, allegedly signed by Gehrig, appears to be a 1940 model with the two star placement on the sweet spot, however, it is likely that the last baseballs Gehrig had the opportunity to sign before the paralysis of his hands were the 1939 AL model without the stars. Researching this issue we found another Gehrig ball and it looked as if the exact same baseball was sold for over $44,000 at Mastro Auctions in 2008. The Gehrig ball offered by Mastro in 2008 (left) and the current Heritage ball (right) were signed on the same 2-star variation of an Official Harridge American League ball. The Heritage ball being offered for sale on February 23rd is authenticated by the same individuals and companies, James Spence of JSA and Steve Grad of PSA/DNA. Mastro sold this 1939 Yankee team ball and noted that the key to determining its 1939 vintage was the signature of one-season Yankee Joe Gallagher (center). The ball's sweet spot is not of the star variation (left) and the authentic signature of Gehrig is found on the sweet spot (right). Before any expert ever ventured to opine on this particular signed baseball, the issue of the manufacturing date of the ball itself should have been addressed first. In fact, when it was examined by the same experts in 2008, the fact that the ball was an OAL Harridge ball manufactured between 1940 and 1945 was already established and disclosed to prospective bidders. The experts were already aware of these facts and the inclusion of the two stars on the sweet spot of the ball. Authentic 1939 Yankee team signed balls which include player Joe Gallagher, who only played one season with the Yankees (April 20-June 13), appear on OAL Harridge balls with no stars. When Mastro offered a 1939 Yankee ball in 2006 they specifically noted: ” The pivotal name on the ball, isolating its 1939 signing, is that of one-year Yankee Joe Gallagher”. This 1939 Yankee team-signed ball sold by Lelands features an authentic signature of Gehrig on the low sweet spot. The ball does not feature Gallagher but is signed on an OAL Harridge ball, without stars. What due diligence was conducted by Spence, Grad and the two authentication companies is unknown. What is known is that it was determined by someone in 2008 at Mastro Auctions that the alleged Gehrig signed ball was of the two-star variety and manufactured between 1940 and 1945. According to ball expert Brandon Grunbaum, the particular ball being sold by Heritage was manufactured and used in Major League play between 1940 and 1942. 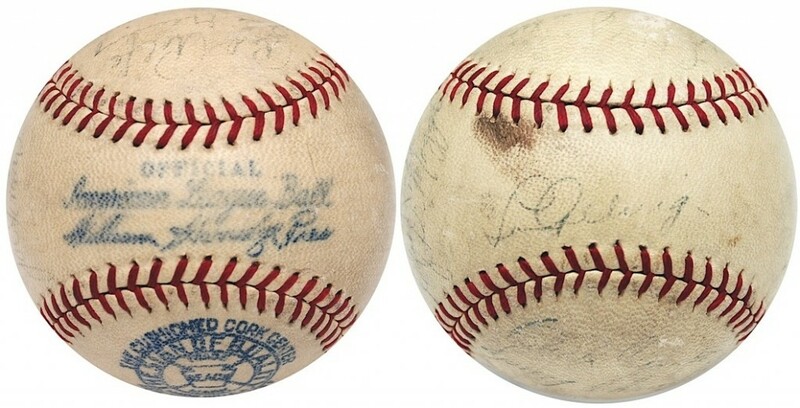 In 2012, Heritage sold another Gehrig ball (left) believed to be a forgery and signed in a style expert Ron Keurajian has warned collectors about. The signature on the current HA offering (center) bears little resemblance to an authentic Gehrig signature on a ball. Another questioned Gehrig ball (right) shows an inscribed signature on the side panel. Heritage's Platunum Auction in NYC also features two other highly questionable baseballs alleged to have been signed by Lou Gehrig. Experts are of the opinion these signatures are forgeries. What, might we ask, is included in JSAs database representing authentic Gehrig handwriting and signatures? In addition to the questioned single-signed Gehrig ball, Heritage is also offering other dubious baseballs alleged to have been signed by the “Iron Horse.” One is an unofficial ball allegedly signed by Gehrig and fellow HOFer Tony Lazzeri and the other is being billed by Heritage as, “The Finest 1927 New York Yankees Team Signed Baseball On Earth.” It appears that the 1927 ball came with a story that Earle Combs gave it to a neighbor, and that apparently was good enough for JSA and PSA. Experts we spoke with have identified the ball as non-genuine. Jimmy Spence of JSA (left) claims to be an expert consultant for the FBI, however, as his lack of skill in authenticating signatures like Lou Gehrig's are exposed, its clear that the FBI should be looking at how Spence is defrauding consumers with his LOA's that accompany Gehrig forgeries that have sold at Legendary and Heritage Auctions (right). Despite all of those years of alleged “combined expertise” the work of both Spence and Grad on Lou Gehrig single signed baseballs speaks volumes. They both are witnesses to a miracle: Lou Gehrig signing a baseball in 1940. It is a damn shame, that all involved arent arrested,taken to court,definately found guilty and sentenced for forgery.This might set a presidence for other fools out there who think they can get away with duping John Q Public. Can’t imagine anyone still paying authenticators for a guess. There’s a darn good reason why they don’t guarantee their guess. How many more times to collectors and sellers of autographs (can’t call them dealers) need to be warned? Best to put that money into a higher grade item and simply purchase from a respectable dealer. It doesn’t have to be real, it just has to be authenticated as such. Sad commentary of the state of the hobby. If it is not real and is auth. that it is,then it is no good and a forgery.So, if you are paying big $s for something that is no good to start with, why would you want to have it auth.as good,you dont make any sense in your comment !!!!!!!!!!!!!!!!!! Im pretty sure VOTC was agreeing with you and saying that everybody lives and dies by the LOA, collecting the LOA more than caring if the item is actually genuine. As we can see there are so many forgeries certified as authentic w LOAs backing them up. This Gehrig ball is the perfect example. Agree 110%, the ball is like the Jack Johnson signed 1948 Leaf card the was auth.by Spence ,but the kicker is ,Johnson passed away 2 yrs earlier. This is Lou Gerigh. I held the pen in my mouth to sign all of these balls. Also in my last will and testament I left Barry Halper my Ipod. Collectors must remember the difference between “authentic” and authenticated”. I have a Reach baseball signed by Babe Ruth in Aug. 1920 Looking to sell.